Sandra Blow was born in London in 1925, she left school at 15 and in 1940 entered St Martin`s School of Art. After the Second World War, Blow studied at the Royal Academy Schools, but in 1947 moved to Italy for a year. There she motorcycled around the countryside and took up with the well-known Italian painter Alberto Burri. 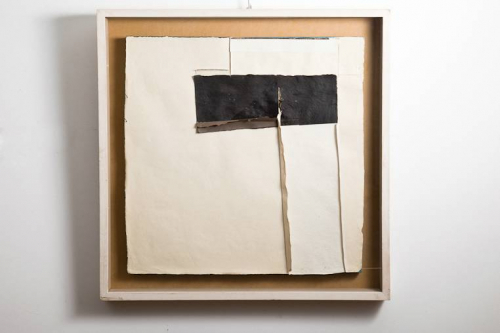 Blow did not produce work of her own in Italy, but she was greatly influenced by Burri`s manner of composing with sackcloth, tar and other low-grade materials. On her return to London in 1950 she began to assert herself artistically becoming one of the pioneering abstract painters in Britain. She used cheap, discarded materials such as sawdust, sackcloth and plaster and paint, producing a visually tactile surface, rooted in earthiness. Throughout the 1950s and early 1960s, she regularly exhibited with Gimpel Fils, the leading London gallery whose association with St Ives artists like Barbara Hepworth, Ben Nicholson and Peter Lanyon anticipated her move in 1957 to live for a year in a cottage at Zennor near St Ives. Blow was widely exhibited abroad throughout this time, establishing the international profile that her cosmopolitan outlook warranted. Participation in peripatetic displays of contemporary British art saw her work promulgated in Italy, Holland, Germany, the United States and later Australasia. Never pedantically descriptive of precise topography, Blow`s pictures like Cornwall (1958) and Space and Matter (1959) - both of which were prominent in her 2001 retrospective at Tate St Ives - nevertheless seemed to echo the forms of the dry-stone walls, granite barns and large foam-spattered rocks that lay beyond her barn studio.